Hanoi paid tribute Monday to former US Senator John McCain, a onetime foe who helped heal the wounds of the Vietnam War after spending years as a prisoner in the city. 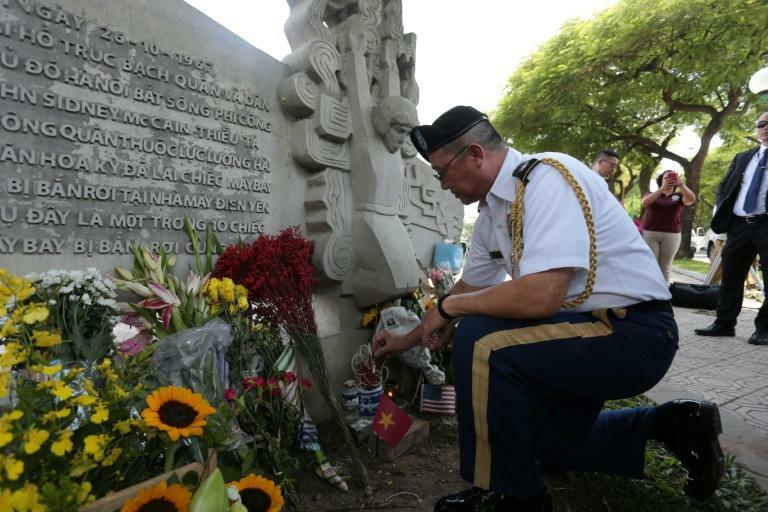 Residents and US officials laid flowers near a concrete sculpture of McCain by the capital's Truc Bach lake, commemorating the site where the former Navy pilot -- who died Saturday aged 81 -- was shot down and detained during the Vietnam War. McCain spent more than five years detained in the infamous "Hanoi Hilton", where he was put in solitary confinement, beaten and tortured. But in the decades after the bloody conflict ended, the Republican presidential candidate was known in Vietnam for his transition from prisoner of war to peacemaker. His death was front page news in Vietnam's state media and drew tributes from across the country. Veterans who fought in the war were among those who travelled to the US embassy in Hanoi to pay their respects. "I admire him for having recognised the right thing... being united with Vietnamese people, so that the two countries could set aside the past, building up the future," said 81-year-old veteran Pham Minh Chuc, who rode his bicycle to the embassy. "It was a pity that we confronted each other on the battlefield," a woman named Nguyen Thi Bich Ngoc wrote in the embassy's condolence book. "But I think with that we had a chance to understand each other more after the war, and you were the one that made a major contribution to building up that link." Vietnam's deputy prime minister Pham Binh Minh wrote that he hoped McCain's family could overcome the loss and described him as someone who helped heal the "wounds of war". The Vietnam War killed an estimated 2.5 million northern Vietnamese fighters, 58,000 American servicemen and some three million civilians before its end in 1975, two years after McCain was released and sent home. McCain visited Vietnam several times after diplomatic ties were restored in 1995 and one of his jailers remembered him fondly, saying he would have voted for him in his failed 2008 presidential bid. Truong Huy San, a prominent social critic, wrote on Facebook Sunday that McCain's personality helped Hanoi and Washington make amends, and said that the country could learn from him. "One man can only become a people's hero when he has not just courage, but also talent and ethics."